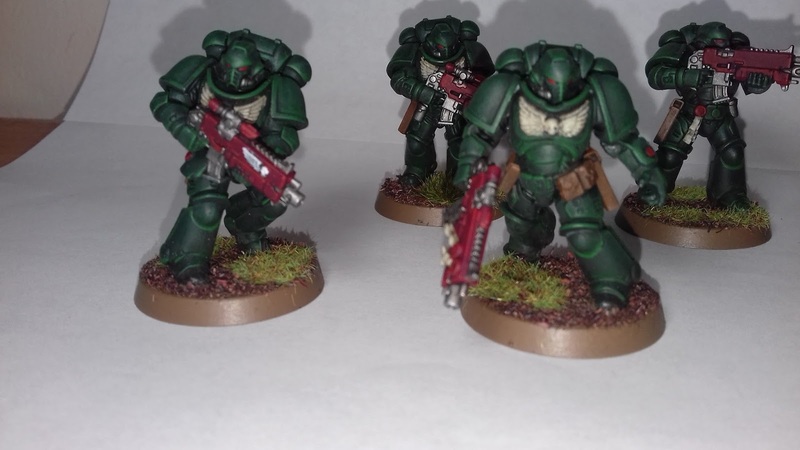 Today's Hobby update sees two completed squads for my Dark Angels army. I painted these two squads up for my London GT tournament army. The recent FAQ has perhaps made the Scout squads a bit less essential to an army, thanks to no more turn 1 deep strikes outside the enemy deployment zone. However, I think they are still a useful addition to the army, as even on the later turns, you want to keep the enemy army away from your forces and the Scouts are good at doing that. I think these turned out ok. 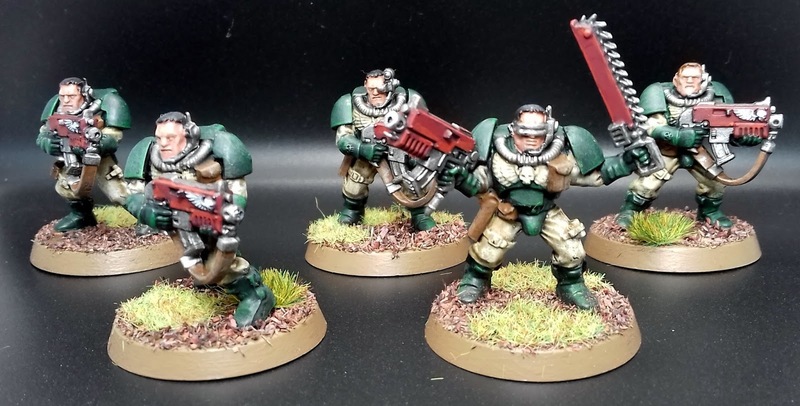 I've no idea why, but I've never really enjoyed painting Space Marine Scouts. 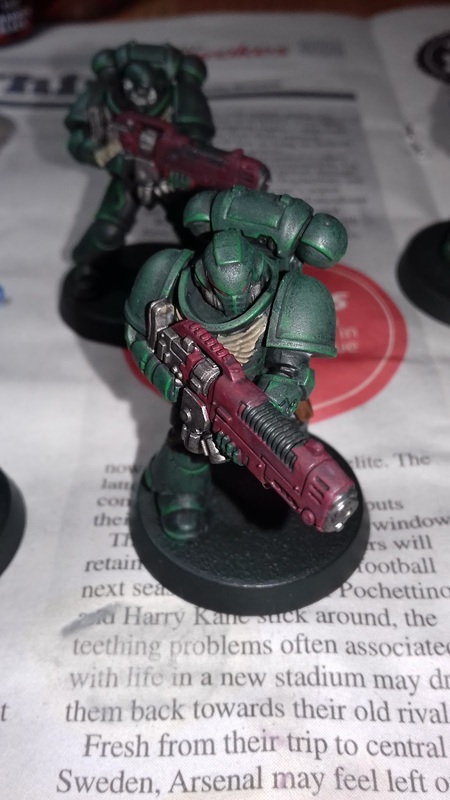 They are great looking models, but for some reason, whenever I paint them up, they just look weird to me. Today's Hobby Update features my Dark Angels Primaris Lieutenant and Primaris Ancient. 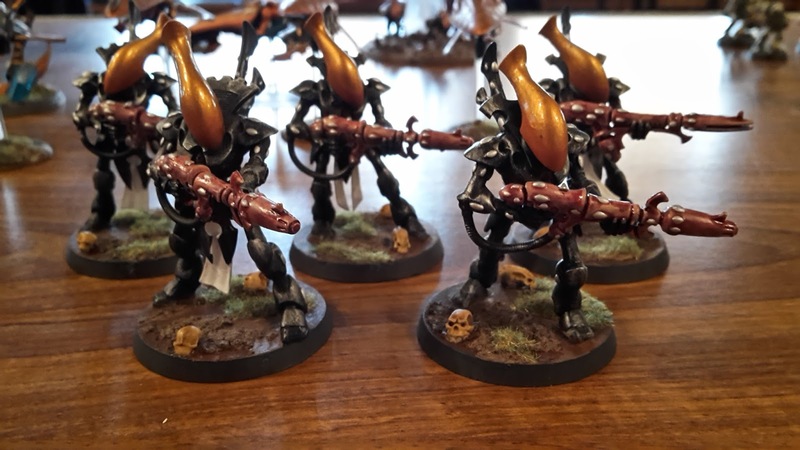 These are new additions for my London GT army. 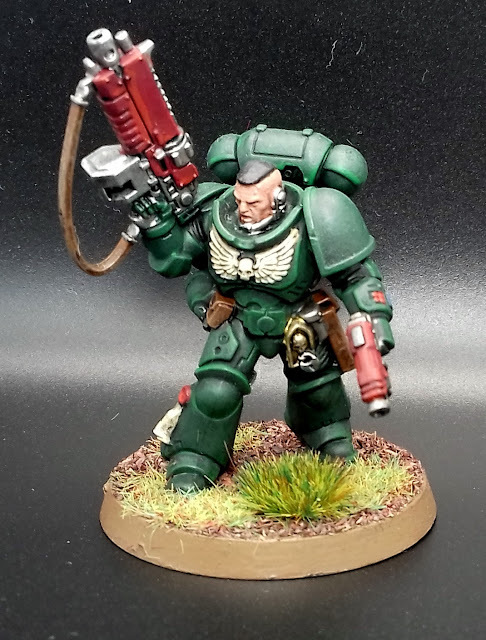 I really like these Primaris models, they are a great scale and have some really nice detail on them. I've also been experimenting with some photo editing from photos with the lightbox. Let me know what you think. 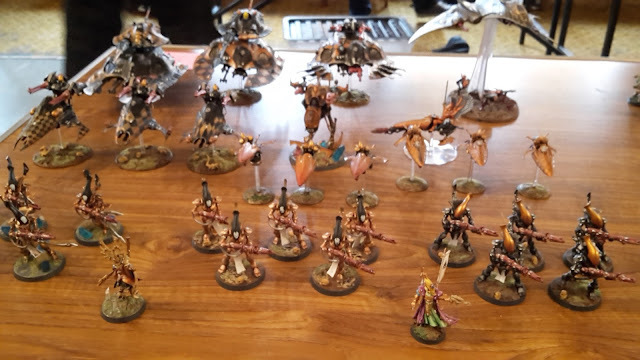 There were some fantastic armies at the recent Uxbridge tournament. 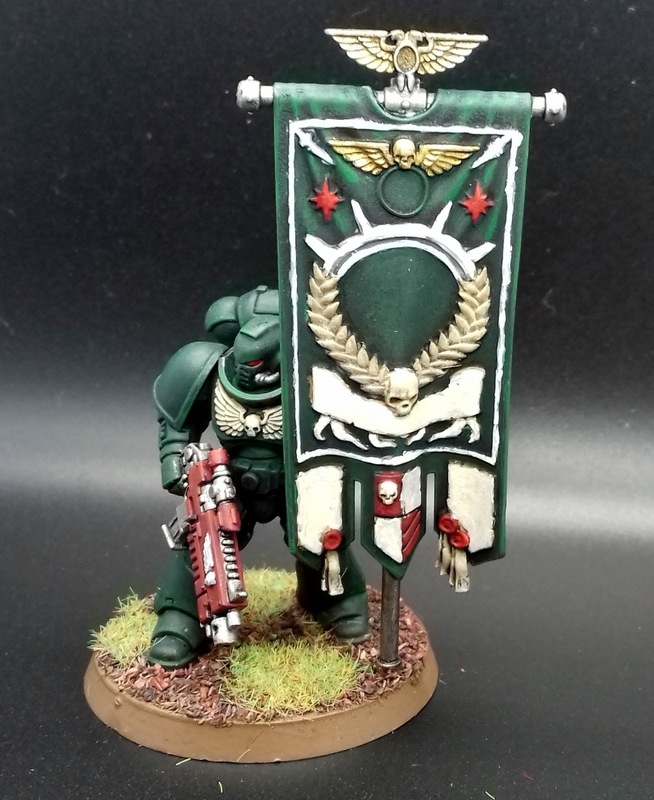 Here are some photos of the armies that were nominated for Best Painted Army, as well as some other pictures that I took during the day. 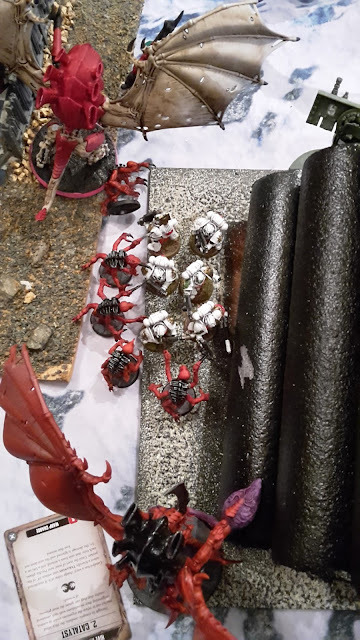 The final game of the day saw my White Scars take on Paulie and his Drukhari/Dark Eldar raiders. 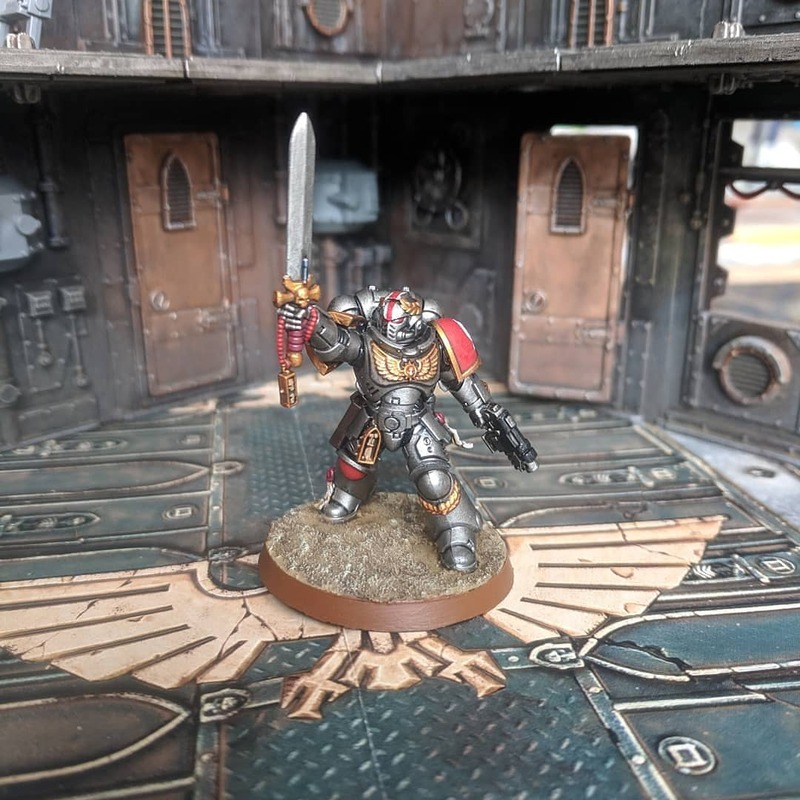 This tournament was played on the day of the release of the new codex, so he wasn't using it in this game, but he was really excited by the new book. The mission for game 3 saw Dominate and Destroy as the Eternal War mission, with Deadlock as the Maelstrom of War mission. The Eternal War mission gave one point for each objective held at the end of your turn and one point for each enemy unit destroyed. The maelstrom mission started with 6 cards on turn 1, 5 cards on turn 2, etc. This would make the first few turns important to try and score as many maelstrom points as possible. 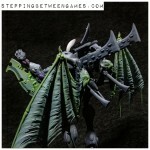 I'm not a big fan of kill point missions, but hopefully the squishy Eldar would make up for that. We were using Dawn of War deployment. After the first three games of the day, I was pretty wiped. I actually considered leaving after game 3 to go home early (I still had an hour drive ahead of me), but am glad that I did not. 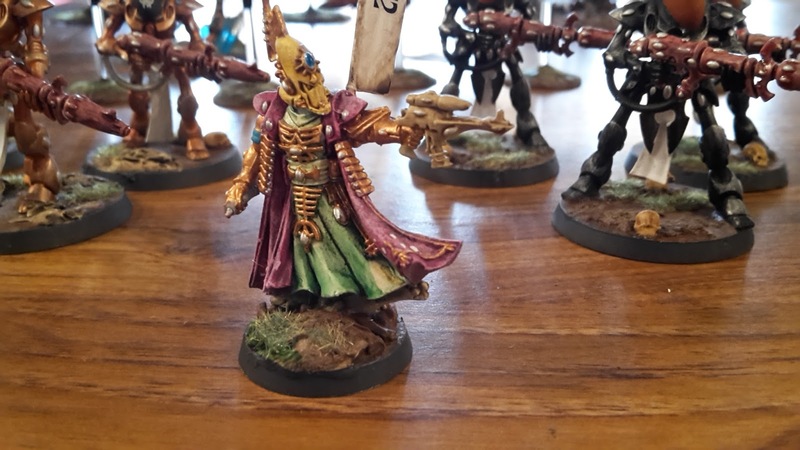 Paulie had a beautiful Dark Eldar army and was a joy to play against. They army won Best Painted Army at the tournament, as it was easy to see why. You can check out more of Paulie's work on his Facebook page, Sky Serpent. Check it out and give him a follow. Remember, you can also follow the St Andrews Wargaming Facebook page. 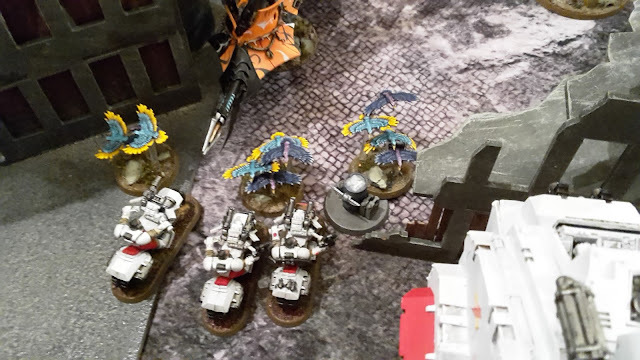 The third game of the tournament say my White Scars Space Marines taken on the forces of the Ultramarines, led by Guilliman himself (commanded by Nick). This game was an ETC-style mission, with Scorched Earth as the Eternal War mission and Tactical Escalation as the Maelstrom of War mission. 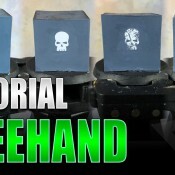 We would also be using Hammer and Anvil deployment. 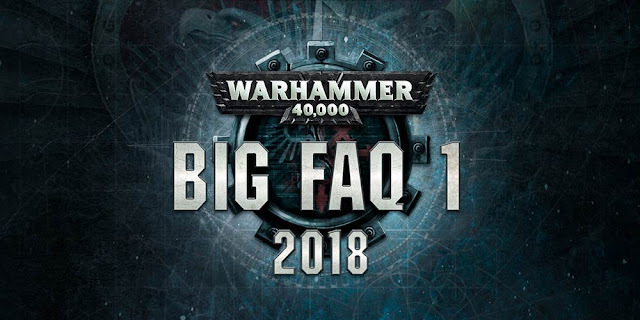 On Monday, the new FAQ for Warhammer 40,000 dropped. There were some big changes to the game and some new proposed rules that should shake things up quite a bit. Here are my initial thoughts on what I think of the new rules and changes. The previous Beta rules on Smite and character targeting have pretty much been made official now with only a few changes. Personally, I didn't think the Beta rules went far enough when it came to Smite spam. Having played against this a few times, it was not a lot of fun to play against and really depressing when you faced it with certain armies. Even when using the new Beta rules, it didn't seem to have much effect on the ability. Most games I played against it, my opponent was still rarely failing any psychic tests and still causing havoc with the power. Maybe that was just great rolling from my opponents, but it didn't really change much for me. The one change I did like was that it was harder to get the D6 mortal wounds after casting Smite a few times. This has now changed and you have the potential to get this a number of times during the turn. Maybe the changes to army composition (more on this below) will help reduce Smite spam, but I still think it may be a problem against some armies, especially Grey Knights and Daemons who seem to have got an exemption from it. I would like to see Smite go from Mortal wounds to automatic wounds, or some such system. Maybe it could ignore invulnerable saves or get -2 or -3 AP. I understand why the mortal wounds mechanic is in place, but it just seems to remove a lot of your ability to block it in the game. Not all armies have access to cheap screening units or FNP bubbles, making it really difficult to block Smite spam or mortal wounds spam with them. 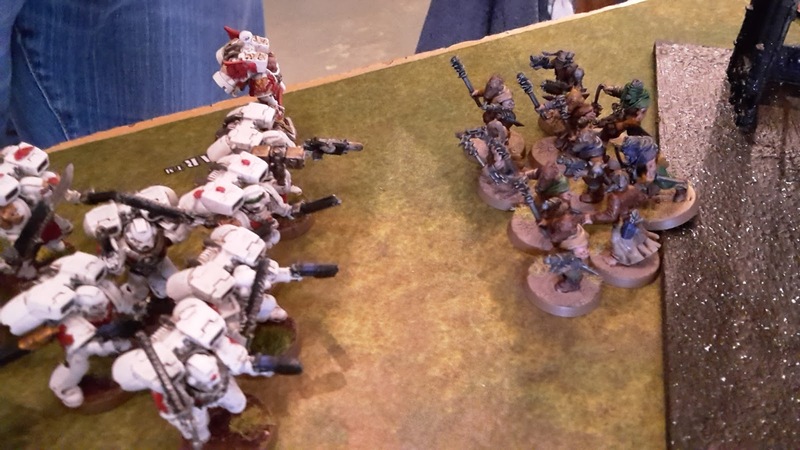 Game 2 of the tournament saw my White Scars taking on Paul and his Chaos Space Marines of the Alpha Legion. This game was an ETC-type mission, with No Mercy as the Eternal War mission and Targets of Opportunity for the maelstrom of war mission, with Search and Destroy deployment. So, another game with kill points and only one turn to achieve your maelstrom points. I recently attended a tournament at BattleUX in Uxbridge. This was the first tournament that they had held, so I was looking forward to seeing how it would turn out, as it is a relatively short drive for me and I might be able to attend on a regular basis. The day was four (yes, four!) 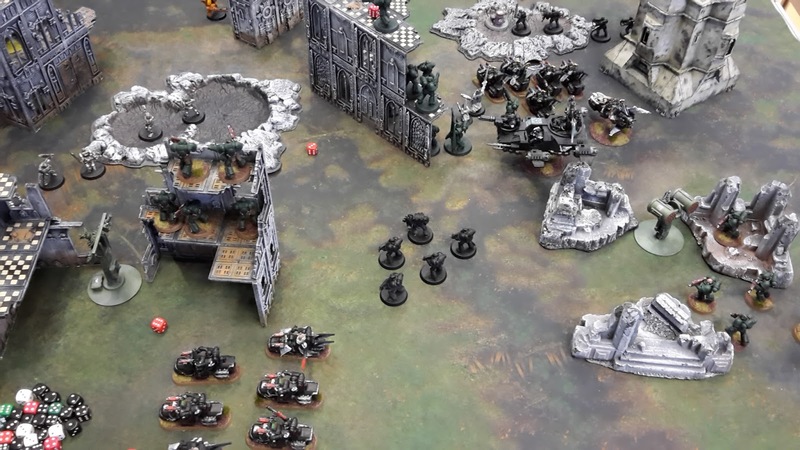 games of 40k at 2000 pts. The missions would follow the ETC-style format, where you would be playing both a maelstrom mission and eternal war mission at the same time. The army was restricted to no duplicate detachments and Forgeworld was allowed. The first mission used Retrieval Mission for the Eternal War (4 objectives, scoring at the end of the game) and Kill Confirmed for the maelstrom of war mission (3 cards per turn, cannot discard any "kill" cards and you score a kill point for each enemy unit destroyed). Remember, you can now follow the St Andrews wargaming Facebook page for all the up to date news on the blog. A had only playtested this exact army once, but it performed rather well in a recent battle report, so I was hopeful for the day. 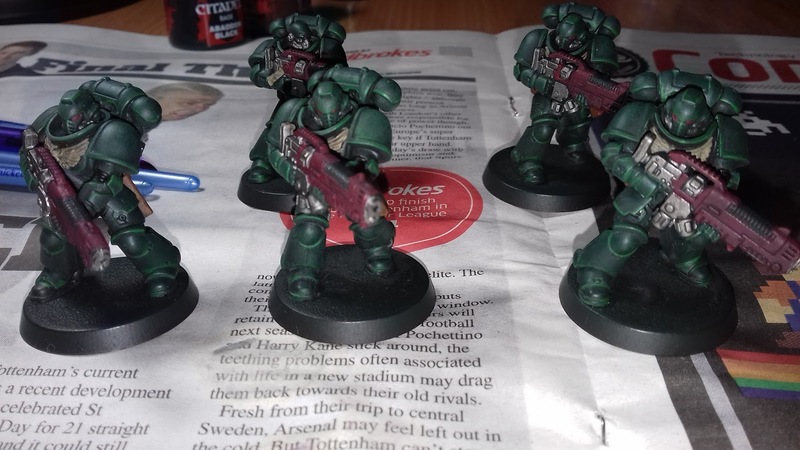 Today's Hobby Sunday features my completed Dark Angels Hellblasters squad. 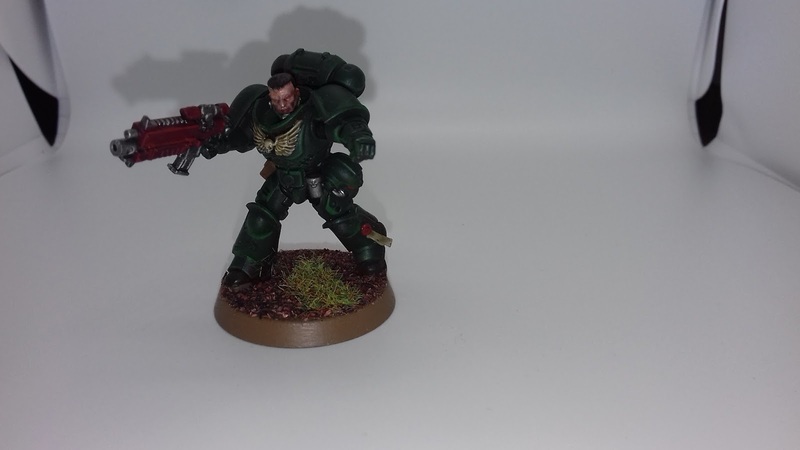 I took the photos in my new lightbox. It's taken me a while to finally get one of these, and I am hoping it will improve the photos of my models. 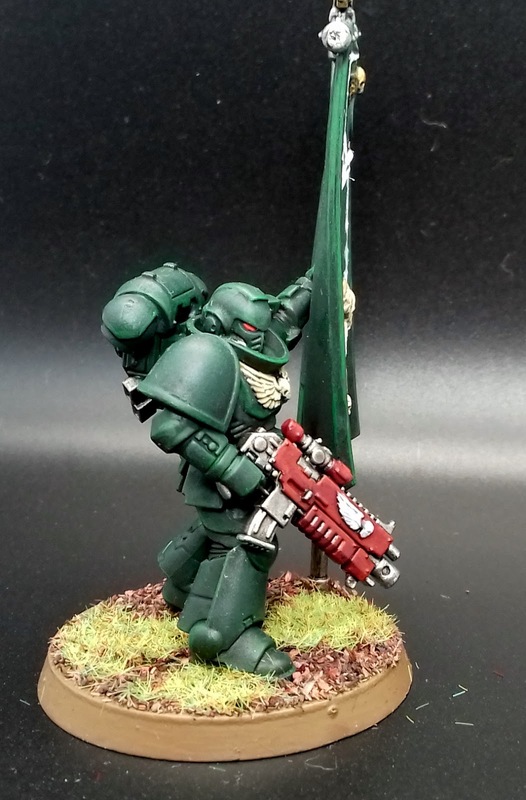 I've only played a few games with this unit, but they are a very strong addition to the Dark Angels army. As well as having an incredibly powerful gun, the Weapons of the Dark Age stratagem allows you to increase their damage by 1. Doing 3 damage per wound on the unit is great, allowing them to take out a huge number of threats. 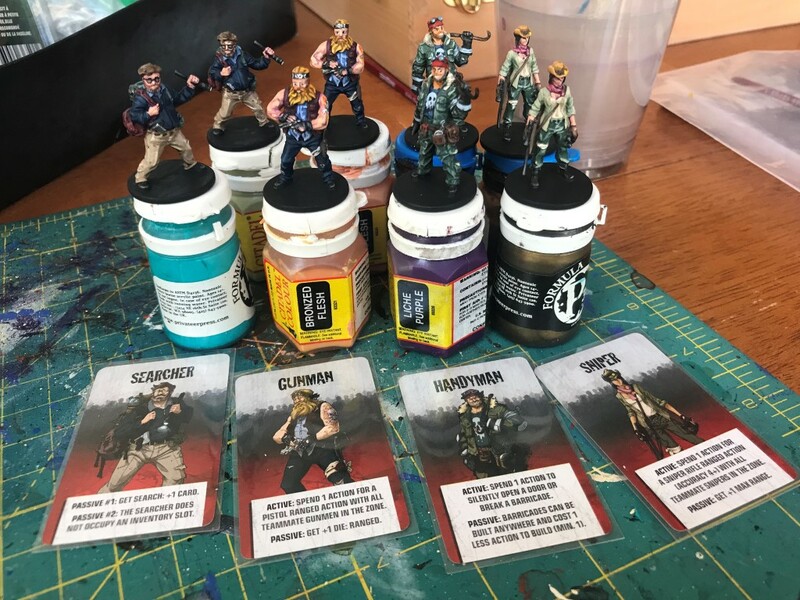 St Andrews Wargaming turns 3 years old! 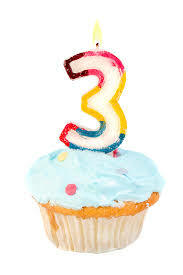 Today, St Andrews Wargaming turns 3 years old. It's hard to believe its only been 3 years since I started this blog, and even harder to believe a time before I spent so much of my free time writing for it! Over the last 3 years, I've written around 620 posts on the blog. That equates to about one post every two days. Hard to believe that I've got that much to say on any topic, never mind 40k! Added to the almost 170 posts for Frontline Gaming, I'll say that has been a pretty productive 3 years. Thanks to everyone who takes the time to read and comment on the blog. I hope the blog continues to grow over the coming years. If you have any suggestions on how to improve it, or anything you would like to see on the blog in the coming years, just let me know. 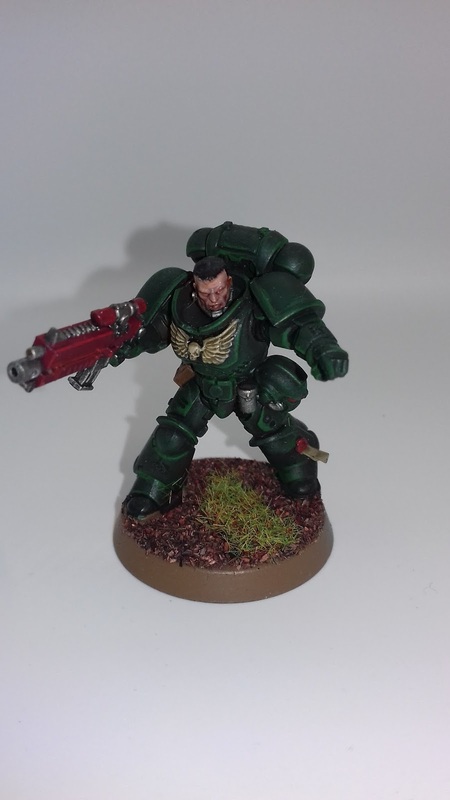 This week's battle report is a 2000 pts game that sees my Dark Angels take on Mark's T'au. For this game, we were playing the new Eternal War mission, Scorched Earth. This is the mission where you score a point for each objective you hold at the end of the turn. 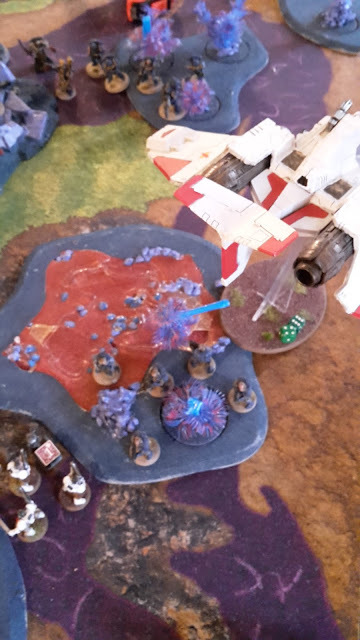 In addition, you can burn an objective in your opponent's deployment zone for D3 points, where it is then removed. We were using the Search and Destroy deployment zone. 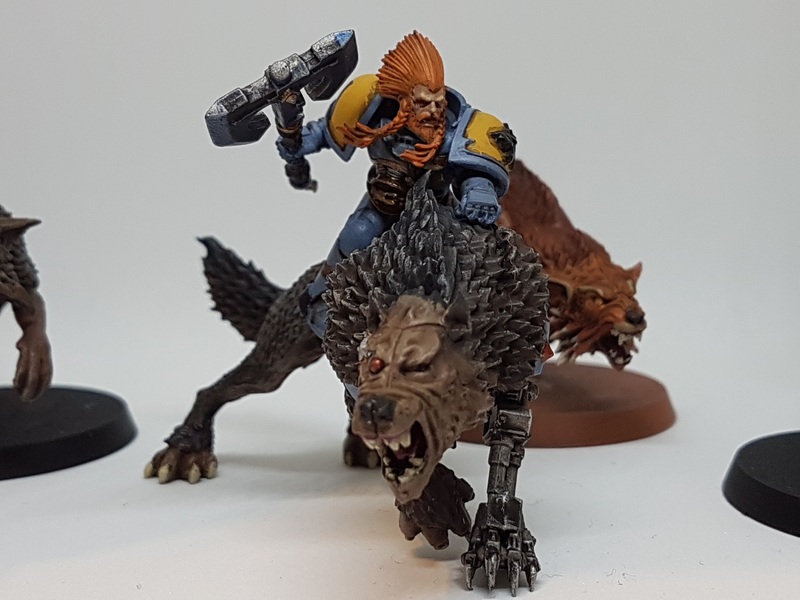 For my force, I was wanting to test out a potential list for the London Grand Tournament in May. I'm still in the process of painting up the models, so apologies for the grey on display! This army has a very strong firebase core. 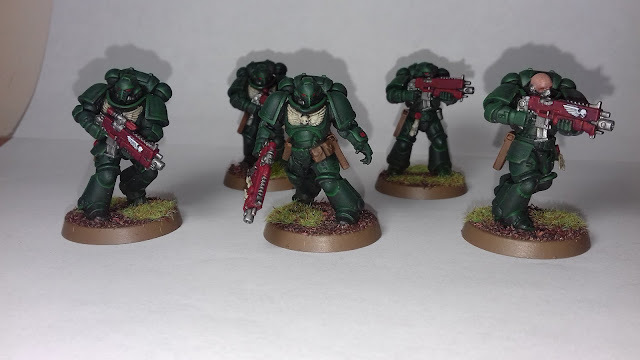 The 10-man Hellblaster squad is back up by Azrael, an Ancient and the Lieutenant. This gives them a very strong offensive and defensive capability, as they get full re-rolls to hit and re-roll of 1 to wound, as well as a 4+ invulnerable. In addition, the Ancient gives them the option to fire back if slain. 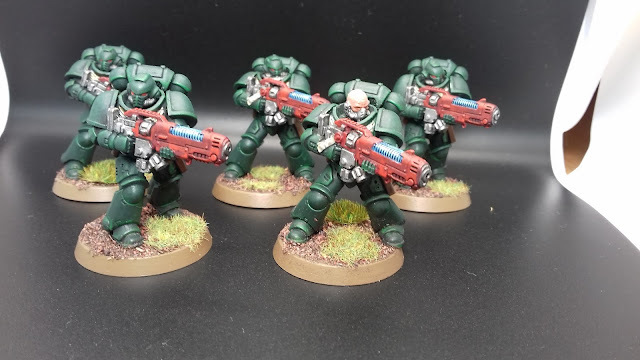 I am trying out the Primaris Intercessors to see how they perform in action, as well as the almost-compulsory three units of Scouts for blocking enemy deep strike movements. The Outrider detachment provides a nice mobile element for the army. Sammael is a great back up for the Black Knights, combined with the Darkshroud to help keep them safe. The two units of Bikers can grab objectives, while the flyer also provides some potent firepower. A new toy for improving my photos on the blog arrived yesterday, a Lightbox. I've been thinking about getting one for a while, and several readers have suggested that it would improve the quality of my photos. 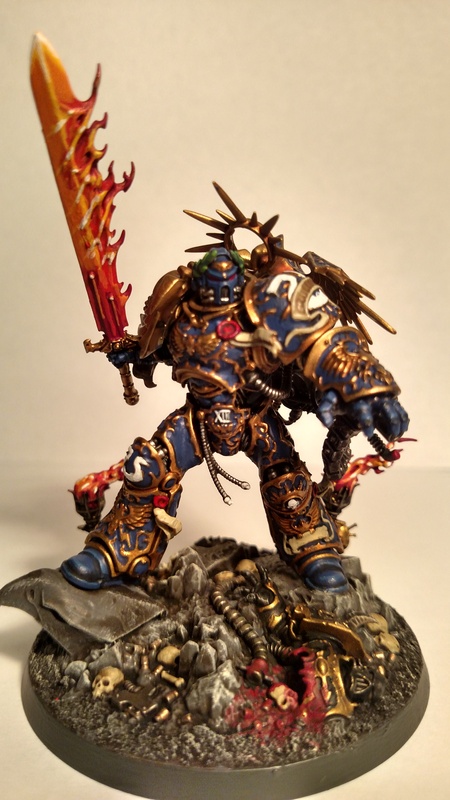 As I have been making an effort to improve my painting skills, it is only right that I try to improve my photos as well to showcase my new talents! I purchased the lightbox after seeing @craig_paints talk about it on twitter. 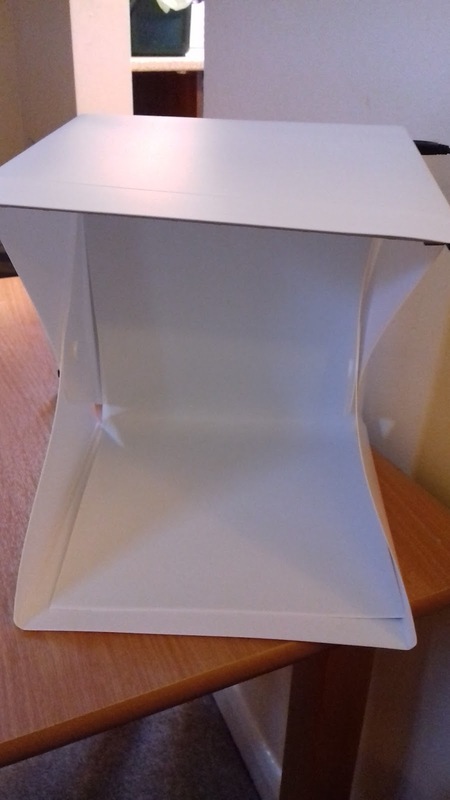 The one I bought was a TFJ studio LED lightbox. It was only £16.99 on Amazon, which seemed like a real bargain for me. Here are some test photos that I took when it arrived. 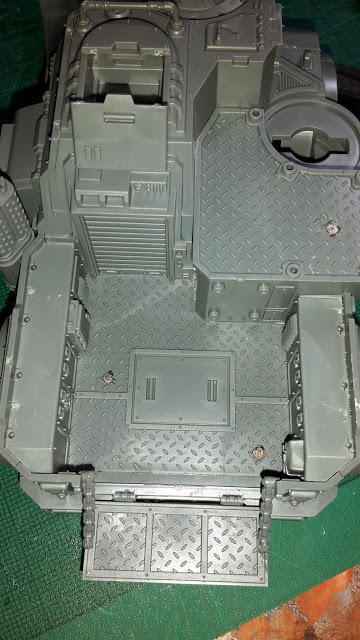 I magnetised my Goliath Truck and Goliath Rockgrinder crew, as well as the weapons options on the Rockgrinder for my Genestealers Cult army. This is a guide to how I carried this out. It actually helps if you don't follow the assembly instructions fully on the Goliath Truck. It is easier to magnetise certain parts of the Truck before assembling the full chassis. 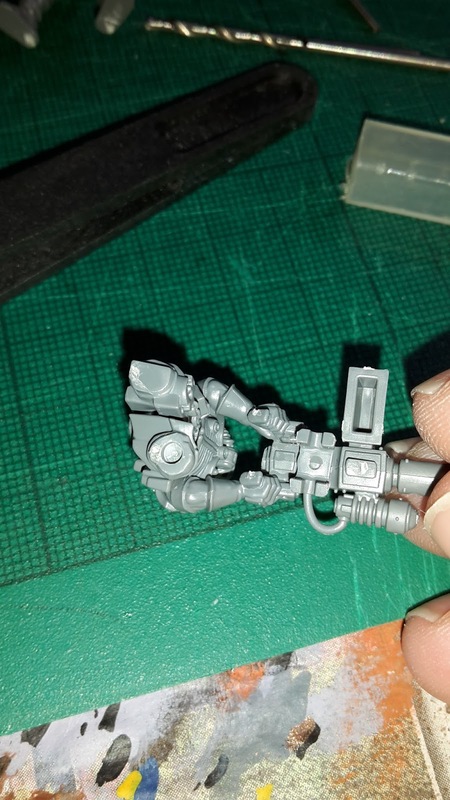 Assemble the Heavy Stubber gunner (Part 2a in the instruction manual). Drill a 2 mm hole in one of the legs with your pin vice. This week's battle report sees my White Scars take on Angus' Sisters of Battle in an ETC tournament mission. Angus was wanting to test his army list for the upcoming London GT, and I was happy to comply. 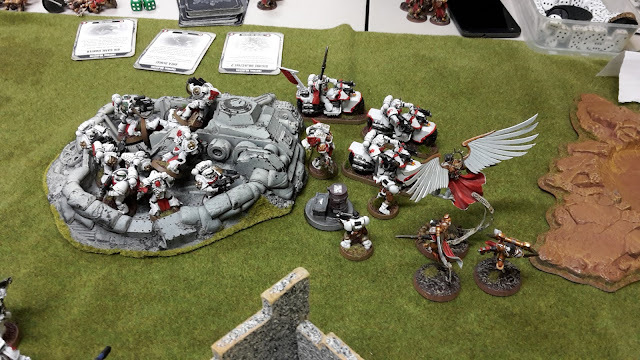 After my last outing with the White Scars, I modified my list to make some changes for another upcoming tournament I would be attending in a few weeks. The ETC mission would use an Eternal War and Maelstrom mission used at the same time. The Eternal War mission was No Mercy, so we would score kill points for each unit destroyed. The maelstrom mission was Spoils of War. This consisted of 3 maelstrom cards per turn. You could also score your opponent's "Secure Objective X" cards and could not discard these during the game. As you can see, a bit of a change for the army. The tournament does not allow multiple detachments of the same type, so I went with three to give me 8 command points. Otherwise, I probably would have gone with two Battalions. The core of the army was very similar, with two Captains and three units of Scouts. I added two Devastator Squads and a Tactical Squad in order to help block off my deployment zone and block enemy deep strikers. The Thunderfire Cannon was also a key addition, as it was really useful to my list. The Meltagun Bikers were then to provide me with some more anti-tank firepower. 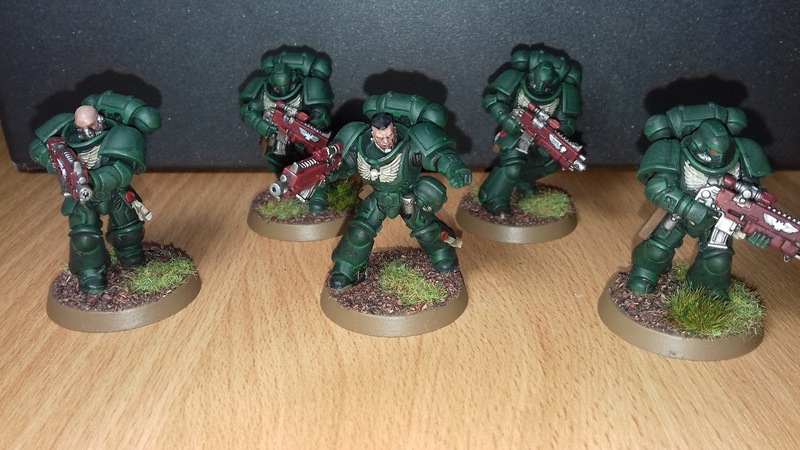 I also took a big unit of Sternguard Veterans, Vanguard Veterans and a Stormraven to give the army a bit more punch. Hopefully, the army would perform well. This week's Hobby Sunday features my first unit of Primaris Intercessors for my Dark Angels army. 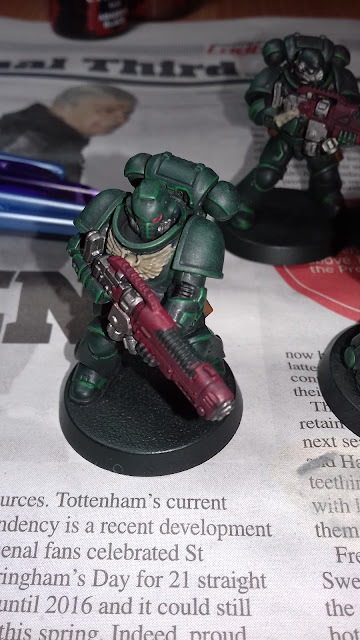 After some feedback from readers, I added some more noticeable red highlights for the gun casing on the Bolters, and looked at the brown leather of the pouches.